The common cold is caused by more than 200 viruses. Rhinoviruses are the most common cause. 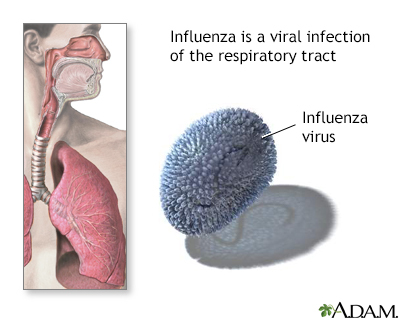 Influenza in humans is caused mainly by two viruses: influenza A and influenza B. There are many different strains and flu viruses constantly mutate. Frequently wash your hands and use hand sanitizer. Avoid touching your hands to your eyes, mouth, or nose. Clean and disinfect commonly touched surfaces and objects. Avoid crowded environments during cold and flu season. Injectable flu vaccines (flu shots) use inactivated (killed) viruses or a recombinant viral protein. Flu shots may either protect against 3 strains of influenza (trivalent) or 4 strains (quadrivalent). Some high-dose or adjuvant-containing flu shots are recommended specifically for people over age 65. Nasal spray flu vaccines use live attenuated (weakened) influenza viruses (LAIV). Colds and flu are usually treated by resting and drinking lots of fluids. Most cases of flu and colds resolve by themselves within a few weeks. However, some people are at increased risk for developing serious influenza complications. They include young children, older adults, pregnant women, and people with chronic health conditions. Recommended antiviral drugs are oseltamivir (Tamiflu), zanamivir (Relenza), and Peramivir (Rapivab). Antiviral drugs can reduce symptom severity and shorten the duration of illness by 1 to 2 days. They work best when started within 2 days of symptom onset. These drugs have a number of side effects. Antibiotics are not used to treat viral infections like the flu, but may be used if secondary bacterial infections develop. The common cold and flu (influenza) are respiratory tract infections that are caused by airborne viruses. Colds and flu primarily affect the upper respiratory tract (nose, sinuses, and throat). The flu can also affect the lower respiratory tract (airways and lungs). The common cold (medically known as rhinopharyngitis or nasopharyngitis) is the most common upper respiratory tract infection. More than 200 different viruses can cause colds. The most common infectious agents for the common cold are rhinoviruses. Less common viral causes include coronaviruses, adenoviruses, influenza, and parainfluenzas. Cold symptoms develop 1 to 3 days after being exposed to the virus and usually resolve within 10 days. Cold symptoms are nearly always less severe than those of the flu. Influenza A is the most widespread flu virus. It can infect birds, pigs, and humans (and a few other mammals). Influenza A is the major cause of global outbreaks of flu (pandemics). Influenza B virus infects only humans. It is less common and generally causes less severe illness than type A. Influenza A is further categorized by subtypes based on two proteins that occur on the surface of the viruses: hemagglutinin (HA) and neuraminidase (NA). There are 18 "HA" subtypes and 11 "NA" subtypes. Therefore multiple surface protein combinations are possible. For example, an H3N2 subtype of influenza A virus will have the HA 3 and NA 2 proteins on its surface. Influenza A viruses are also categorized by their hosts (humans, birds, and swine). All influenza A viruses can infect birds, but only a few circulate in human populations. Two particularly important and serious human influenza A viruses are H1N1 and H3N2. The annual seasonal flu vaccine always includes an influenza A H1N1 strain, an influenza A H3N2 strain, and one or two influenza B strains. (Influenza B viruses are not subtyped.) Unfortunately, influenza A frequently mutates and in some years the vaccine is not as effective. Influenza A viruses are commonly found in wild birds, especially water fowl. These avian (bird) flu viruses sometimes cause outbreaks in domestic poultry such as chickens, ducks, and geese. Since the early 2000s there have been several of these outbreaks reported in Asian countries. While most bird flu virus strains are relatively harmless, a few develop into "highly pathogenic avian influenza," which can be very deadly for domesticated poultry and, in some cases, people. Most of the time, avian flu stays contained within bird populations. However, some of these strains can be transmitted directly from birds to people and cause serious or even fatal illness. Avian influenza H5N1 and H7N9 are two bird flu viruses that have infected humans. Both viruses can cause serious, and fatal, disease due to pneumonia and respiratory distress. Most cases of transmission involve people who come into direct contact with infected birds. In their current form, avian influenza viruses do not easily spread from person to person. However, if the viruses continue to mutate, more cases of human transmission of avian flu may occur, which would increase the possibility of a global outbreak (pandemic). Influenza A viruses also infect pigs. These swine influenza viruses do not normally spread to people. However, pigs are susceptible to flu viruses found in both birds and people. When pigs are infected with bird flu, their bodies can act as "mixing bowls" to create new strains that can be passed between people. The 2009 H1N1 pandemic occurred from a new virus that emerged from a combination of bird, pig, and human strains. It spread as the virus passed from pigs to humans, and then from people to people. H1N1 is now established as a human seasonal flu virus that also circulates in pigs. Colds and the flu tend to occur more often in the winter. In the northern hemisphere, flu season typically starts in October and lasts into mid-March. Colds and flu are more likely to be transmitted in winter because people spend more time indoors and are exposed to higher concentrations of airborne viruses. Dry winter weather also dries up nasal passages, making them more susceptible to viruses. You cannot get colds or flu by getting cold, wearing insufficiently warm clothes in warm weather, or going outside with wet hair. Everyone is at risk for colds and the flu, but certain people have a greater risk for experiencing complications. Young children (under age 4) and older adults (over age 65) have a higher risk for colds and flu and their associated complications. Colds and flu usually cause mild illness with symptoms resolving within 7 to 10 days. In some cases, especially with people who have existing health issues, these viruses can cause more serious health problems. Colds and flu can put extra stress on inflamed airways and can worsen asthma attacks. Problems with wheezing may persist for weeks after a cold or flu. People with asthma also have an increased risk for bronchitis and pneumonia complications. Ear infections such as acute otitis media (AOM) are caused by bacteria, but viruses can set the stage for a bacterial infection. In fact, preventing colds and influenza is one of the best ways to prevent ear infections. Rhinoviruses and influenza viruses can cause the membranes along the walls of the inner ear passages to swell and obstruct the airways. If this inflammation blocks the narrow Eustachian tube, the middle ear may not drain properly. Fluid builds up and becomes a breeding ground for bacteria and subsequent infection. Sinusitis is an inflammation or infection of the sinuses, the air-filled chambers in the skull that are located around the nose. Acute sinusitis typically starts with the common cold virus. A cold can set the stage for sinusitis by causing inflammation and congestion in the nasal passages, leading to obstruction in the sinuses. When the sinuses cannot drain properly, bacteria can multiply within the mucus lining, causing sinusitis. If sinusitis persists for more than 12 weeks, it is called chronic sinusitis. Bronchitis is swelling and inflammation of the bronchial tubes that carry air to the lungs. The swelling narrows the airways, causing a deep mucus-producing cough and making it harder to breathe. Acute bronchitis lasts from 2 to 10 days and is usually always preceded by a cold or flu. Pneumonia is one of the most dangerous complications of influenza. Young children, older adults, and people with chronic health conditions or immune system problems are at greatest risk for pneumonia. The flu virus can directly cause viral pneumonia, and lead to secondary bacterial infections that cause bacterial pneumonia. A cold nearly always begins with throat irritation and nasal congestion and sneezing. Most symptoms resolve within 10 days, but cough can last up to 2 weeks. The flu usually begins rapidly with chills, muscle aches, fatigue, and fever, in addition to symptoms similar to the common cold. Children may experience vomiting and diarrhea. Most symptoms subside after a few days. Cough and fatigue may linger for several weeks. Differentiating between a cold and flu can be difficult. Cold symptoms are nearly always less severe than those of the flu. Colds and flu are generally diagnosed based on clinical symptoms. The presence of fever can help distinguish cold from flu. Your health care provider will also make note if your symptoms coincide during a time of active influenza outbreaks in your area. In certain cases, your provider may want to do a laboratory exam for influenza by using a nasopharyngeal culture. This involves using a swab to take secretion samples from your nose or throat. This test should be done within 4 days of your first symptoms. Some tests using nasopharyngeal samples can produce results within 15 minutes. However, these rapid tests often produce false negative results (indicating no influenza when influenza is present) when flu activity is high, and false positive results (indicating influenza when no influenza is present) when flu activity is low. In addition, most of these tests do not distinguish between influenza A or B or provide information on influenza A subtypes. Symptoms of allergic rhinitis include nasal obstruction and congestion, which can be similar to the symptoms of a cold. Allergic rhinitis is not caused by a virus. It is caused by an immune system reaction triggered by exposure to an allergen. Colds and flu are often accompanied by aches and pain. A fever is a definite sign that the condition is a cold or flu and not allergic rhinitis. Other types of viruses can cause symptoms similar to influenza. They include respiratory syncytial virus (RSV) and human parainfluenza viruses (HPIVs). RSV and parainfluenzas are common causes of respiratory infections and pneumonia in babies and young children, but these viruses can also affect adults. The viruses that cause colds and flu are transmitted through the air. You can catch a cold or flu when you breathe in tiny airborne droplets from the coughs or sneezes of someone who is sick. You can also catch a cold or flu if you touch something with the virus on it and then touch your mouth, nose, or eyes. Symptoms of colds and flu start about 1 to 4 days after the virus enters your body. You can be contagious to others a day before symptoms begin and even for a few days after they begin to fade. Most symptoms typically last about a week. You are most contagious when your symptoms are at their worst. Disinfect your environment by cleaning commonly touched surfaces and objects. Get an annual flu vaccine. Staying home when you are sick and for at least 24 hours after your fever is gone. Coughing or sneezing into a tissue or into the crease of your elbow (not the air). Avoiding sharing food, utensils, cups, or plates. Wearing a face mask when you are around people. The best way to avoid getting influenza is to get a seasonal flu vaccine. (There is no vaccine for the common cold.) The U.S. Centers for Disease Control (CDC) recommends annual flu vaccination for everyone age 6 months and older. The flu vaccine is available as an injection (flu shot) or as a nasal spray. There are many types of these vaccines. Some vaccines are only appropriate for certain people based on age and other factors. If you have a severe allergy to eggs, or have certain chronic health conditions, talk to your health care provider before getting vaccinated. There are flu shots available that do not contain egg substances. The flu vaccine is reformulated every year based on a prediction of which strains of flu are most likely to occur. Flu viruses constantly mutate and change in a process called antigenic drift. (Antigens are foreign molecules that the immune system specifically recognizes as alien and targets for attack.) Unfortunately, sometimes flu strains can change within the course of a flu season, so in some years the vaccine is not as effective. Even a mismatched vaccine can still provide protection against related viruses. A flu vaccine contains 3 or 4 flu strains, so you will always be getting some protection. Even if you catch the flu, a vaccine can help by giving you a milder case of flu than you would have had if you were not vaccinated. You should try to get a flu vaccine as soon as it becomes available for the season (usually in September or October), but even if you get it later in the season it can still help. It takes about 2 weeks after you get vaccinated for the vaccine to take full effect. Most people get a flu shot. A nasal spray vaccine (LAIV4) can also be used in healthy children or adults when the seasonal CDC guidelines indicate it. The nasal spray vaccine is called a live, attenuated influenza vaccine (LAIV). It contains live, but weakened, flu viruses. Flu shots contain inactivated (not live) viruses or recombinant viral proteins. Flu shots contain and protect against either 3 (trivalent) or 4 (quadrivalent) viruses. The LAIV nasal spray contains 4 viruses. Flu shots also come in different dose strengths. A high-dose flu shot is available specifically for people age 65 and older. A trivalent flu vaccine protects against 2 influenza A viruses (H1N1 and H3N2) and one influenza B virus. A quadrivalent flu vaccine protects against the 2 influenza A viruses plus 2 influenza B viruses. The addition of a second influenza B virus provides broader protection. The most common side effects after a flu vaccine are soreness at the injection site (for a flu shot), low-grade fever, and body aches. These symptoms usually subside within 2 days. In rare cases, people can have an allergic reaction. You cannot get the flu from a flu vaccine and there is no link between vaccines and autism spectrum disorder. Most cases of colds and flu can be treated at home by resting and drinking fluids. Home remedies and some medications cannot help cure cold or flu, but may help provide symptom relief. People who are at risk for complications include those with chronic health conditions (asthma, diabetes, heart disease, and obesity), people over age 65, children younger than age 5, and pregnant women. If a high-risk person has the flu, their provider may recommend an antiviral medication. Antibiotics are not prescribed for treating viral infections such as colds and flu. They may be prescribed if a secondary bacterial infection develops. Rest as much as you can to help your body fight off the infection. Consume hot fluids such as tea, broths, and soup. There is evidence that chicken soup can indeed help with mucous congestion and other cold and flu symptoms. Ginger or peppermint teas can be very soothing. Add honey to tea or hot lemon water. The American Academy of Pediatrics recommends honey to treat coughs in children. However, honey cannot be administered to infants under 12 months of age, due to the risk of infant botulism. Gargle with salt water to treat sore throat. Throat sprays or lozenges can also help. Try steam inhalation for cough and sinuses. Place a towel over your head while leaning over a bowl or pot of hot (not boiling) water. Breathe deeply. You can add herbs or essential oils such as thyme, rosemary, eucalyptus, peppermint, or bay leaves. Use a vaporizer or humidifier. Do not smoke and avoid secondhand smoke. Do not drink alcohol. Alcohol induces dehydration and may interfere with cold medicines. Before reaching for a decongestant medication, try doing a nasal wash with a saline (salt water) solution. A saline solution can be purchased in a spray bottle at a drug store or made at home. (Mix 1 teaspoon or 5 mL of table, Kosher, or sea salt with 2 cups or 480 mL of warm water. Some people add a pinch of baking soda.) If you prepare your own saline solution, use bottled or boiled water, not plain tap water, to avoid potential infections with a dangerous type of water-dwelling parasite called Naegleria fowleri. Perform the nasal wash 1 to 2 times a day. It can help moisten nasal passages and remove mucus. Lean over the sink head down. Pour some solution into the palm of the hand and inhale it through the nose, one nostril at a time. Spit out the remaining solution. Lean over the sink with your head tilted to one side. Insert the spout of the Neti pot in the upper nostril. Slowly pour the salt water into your nose while continuing to breathe through your mouth. The water will flow through the upper nostril and out through the lower nostril. When the water finishes dripping out, blow your nose. Reverse the tilt of your head and repeat the process with the other nostril. Antiviral medications are given to treat influenza (not the common cold). These drugs are available only by prescription. They should be started within 2 days of symptom onset, although they can still be helpful if started later. These drugs can reduce symptom severity and help shorten the duration of illness by 1 to 2 days. Anyone with influenza is a potential candidate for an antiviral drug, but these medications are most important for people who are severely ill or at risk for influenza complications. This includes young children, pregnant women, and people with compromised immune systems or chronic health conditions. People at risk for complications should receive immediate treatment with an antiviral drug without waiting for diagnostic testing to confirm influenza. Oseltamivir (Tamiflu). Available for adults and children as a pill or liquid that is taken for 5 days. Zanamivir (Relenza). Available for adults and children and administered by oral inhalation for 5 days. Peramivir (Rapivab). Administered to adults intravenously in a single dose. These drugs are classified as neuraminidase inhibitors. Antiviral drugs are modestly effective for treating influenza but have a number of side effects. For this reason, they are generally reserved for people most at risk for serious complications. Side effects may include nausea, vomiting, diarrhea, dizziness, headache, and behavioral changes. Zanamivir should not be used by people with breathing problems like asthma or COPD. Over-the-counter (OTC) medications are available without a prescription. Combination OTC cough and cold medicines contain more than one medicine, such as decongestants and antihistamines or pain relievers. (Antihistamines are often included in nighttime cold products to produce sleepiness.). Read the labels carefully to make sure you do not take too much of any one medicine. Ask your health care provider which cold medications are safe for you. The FDA advises that cough and cold medicines should not be given to children younger than age 4. These drugs can cause serious side effects in young children. Oral decongestants contain pseudoephedrine or phenylephrine. Products that contain pseudoephedrine are kept behind the counter to prevent potential use for the illegal manufacturing of methamphetamine. Nasal decongestants come in long-acting and short-acting forms. Long-acting brands often contain oxymetazoline and can last for up to 12 hours. Short-acting brands often contain phenylephrine and last for up to 4 hours. Ipatropium bromide can help relieve a runny nose, but not congestion. Nasal decongestants are applied directly into the nasal passages. Nasal forms work faster than oral decongestants and have fewer side effects. However, nasal decongestants should never be used for more than 3 days in a row due to risks for rebound congestion. Oral decongestants provide temporary relief for up to 4 hours. They can cause side effects such as nervousness, dizziness, and sleepiness. People who have high blood pressure should never use standard pseudoephedrine or phenylephrine decongestants. They should instead use antihistamines or combination products such as Coricidin HBP, which contains the antihistamine chlorpheniramine. If you have high blood pressure, heart disease, diabetes, thyroid disease, prostate problems, or glaucoma talk to your health care provider before taking any oral or nasal decongestant. You may be at risk for side effects and complications. Cough suppressants (antitussives) block the cough reflex. They often contain dextromethorphan. Cough expectorants loosen and thin mucus so you can cough it up. Guaifenesin is the ingredient used in expectorants. Some cough products also contain decongestants and antihistamines that may alleviate other cold/flu symptoms. Antihistamines may make you sleepy. Decongestants may actually worsen cough by thickening mucus. Studies have questioned the effectiveness of OTC cough remedies. Medications that contain both a cough suppressant and an expectorant are not useful and should be avoided. As noted, never give cough or cold medicine to a child under 4 years without a pediatrician's approval. If your cough lasts for more than 3 weeks, or is accompanied by shortness of breath, contact your provider. A lingering cough may be a sign of bronchitis or pneumonia. Many people take medications to reduce the mild pain and fever associated with colds and flu. The most common types of over-the-counter pain medicines are acetaminophen (Tylenol, generic) and nonsteroidal anti-inflammatory drugs (NSAIDs). NSAIDs include ibuprofen (Advil, Motrin, generic), naproxen (Aleve, generic), and aspirin. Aspirin and aspirin-containing products should never be given to children or adolescents who have the flu or chicken pox. Reye syndrome is a serious and potentially fatal brain condition that can occur when children with viral infections are given aspirin. Never give aspirin to your child unless directed to do so by a provider. NSAIDs are generally safe when taken for a short period of time (less than 10 days). However, if you have heart conditions, high blood pressure, or history of stomach bleeding, talk to your provider. Acetaminophen in high dosages can cause serious liver injury. When taking combination medicines, always check the ingredients for the presence of acetaminophen, and make sure never to take more than the recommended daily dose of 3 grams (3,000 mg) in a single day. Always check product labels for recommended dosages for adults and children. Vitamin C, also known as ascorbic acid, is an antioxidant. It is naturally found in fruits and vegetables, especially citrus fruits, cantaloupe, kiwi, bell peppers, tomatoes, and leafy greens. For most people, vitamin C supplements or vitamin C-rich foods do not reduce the risk of getting the common cold. The recommended daily allowance of vitamin C for adults is 90 mg/day for men and 75 mg/day for women. High doses may increase the risk for kidney stones. Doses over 2,000 mg/day may cause nausea and diarrhea. Large amounts of vitamin C can interact with many medications including aspirin, acetaminophen, and blood-thinner drugs like warfarin. Zinc is a trace mineral that helps strengthen the immune system. It is found naturally in high-protein foods (red meat), nuts, whole grains, and legumes. Zinc lozenges are often marketed as cold remedies but it is unclear how effective they are. A review of 16 studies suggested that when started within 24 hours of symptom onset, oral zinc may shorten the duration of colds. However zinc lozenges do not appear to be helpful for preventing colds or reducing symptom severity. Oral zinc has a number of side effects including bad taste and nausea. High doses of oral zinc (more than 40 mg/day) can cause vomiting, diarrhea, and serious side effects. Zinc can interact with a number of medications, including antibiotics. Zinc nose spray is not recommended because it can cause a loss of smell. Popular "immune-boosting" herbal remedies for colds and flu include Echinacea, goldenseal, elderberry, and astragulus. There is little evidence for their benefit. However, peppermint and ginger teas can aid digestion and be soothing (although not curative) if you are feeling sick. People who take herbal supplements should be aware that these products are not regulated by the FDA. There is no guarantee that the products you buy actually contain the herbs listed on the label. American Academy of Pediatrics. Healthychildren.org website. Caring for your child's cold or flu. www.healthychildren.org/English/safety-prevention/at-home/medication-safety/Pages/How-to-Manage-Colds-and-Flu.aspx. Updated April 20, 2017. Accessed May 17, 2017. Centers for Disease Control and Prevention website. CDC health update regarding treatment of patients with influenza with antiviral medications. emergency.cdc.gov/han/han00375.asp. Updated January 9, 2015. Accessed February 25, 2015. Centers for Disease Control and Prevention website. What you should know about flu antiviral drugs. www.cdc.gov/flu/antivirals/whatyoushould.htm. Updated January 5, 2017. Accessed April 23, 2017. Committee on Infectious Diseases; American Academy of Pediatrics. Recommendations for prevention and control of influenza in children, 2014-2015. Pediatrics. 2014;134(5):e1503-e1519. PMID: 25246619 www.ncbi.nlm.nih.gov/pubmed/25246619. De Sutter AI, Saraswat A, van Driel ML. Antihistamines for the common cold. Cochrane Database Syst Rev. 2015;(11):CD009345. PMID: 26615034 www.ncbi.nlm.nih.gov/pubmed/26615034. Deckx L, De Sutter AI, Guo L, Mir NA, van Driel ML. Nasal decongestants in monotherapy for the common cold. Cochrane Database Syst Rev. 2016;10:CD009612. PMID: 27748955 www.ncbi.nlm.nih.gov/pubmed/27748955. Dobson J, Whitley RJ, Pocock S, Monto AS. Oseltamivir treatment for influenza in adults: a meta-analysis of randomized controlled trials. Lancet. 2015;385(9979):1729-1737. PMID: 25640810 www.ncbi.nlm.nih.gov/pubmed/25640810. Food and Drug Administration website. Use caution when giving cough and cold products to kids. www.fda.gov/drugs/resourcesforyou/specialfeatures/ucm263948.htm. Updated November 4, 2016. Accessed May 18, 2017. Ghebrehewet S, MacPherson P, Ho A. Influenza. BMJ. 2016;355:i6258. PMID: 27927672 www.ncbi.nlm.nih.gov/pubmed/27927672. Gold Standard Drug Database. Drug Monograph: Ascorbic Acid, Vitamin C 2017. www.clinicalkey.com/#!/content/drug_monograph/6-s2.0-42. Accessed May 18, 2017. Grohskopf LA, Sokolow LZ, Broder KR, Walter EB, Fry AM, Jernigan DB. Prevention and Ccontrol of Sseasonal Iinfluenza with Vvaccines: Rrecommendations of the Advisory Committee on Immunization Practices - United States, 2018-19 Influenza Season. MMWR Recomm Rep. 2018;67(3):1-20. PMID: 30141464 www.ncbi.nlm.nih.gov/pubmed/30141464. Harris AM, Hicks LA, Qaseem A; High Value Care Task Force of the American College of Physicians and for the Centers for Disease Control and Prevention. Appropriate antibiotic use for acute respiratory tract infection in adults: advice for high-value care from the American College of Physicians and the Centers for Disease Control and Prevention. Ann Intern Med. 2016;164(6):425-434. PMID: 26785402 www.ncbi.nlm.nih.gov/pubmed/26785402. Hemilä H, Chalker E. Vitamin C for preventing and treating the common cold. Cochrane Database Syst Rev. 2013;1:CD000980. PMID: 23440782 www.ncbi.nlm.nih.gov/pubmed/23440782. Hemilä H. Zinc lozenges and the common cold: a meta-analysis comparing zinc acetate and zinc gluconate, and the role of zinc dosage. JRSM Open. 2017;8(5):2054270417694291. PMID: 28515951 www.ncbi.nlm.nih.gov/pubmed/28515951. Heneghan CJ, Onakpoya I, Thompson M, Spencer EA, Jones M, Jefferson T. Zanamivir for influenza in adults and children: systematic review of clinical study reports and summary of regulatory comments. BMJ. 2014;348:g2547. PMID: 24811412 www.ncbi.nlm.nih.gov/pubmed/24811412. Jefferson T, Jones M, Doshi P, Spencer EA, Onakpoya I, Heneghan CJ. Oseltamivir for influenza in adults and children: systematic review of clinical study reports and summary of regulatory comments. BMJ. 2014;348:g2545. PMID: 24811411 www.ncbi.nlm.nih.gov/pubmed/24811411. Karsch-Völk M, Barrett B, Kiefer D, Bauer R, Ardjomand-Woelkart K, Linde K. Echinacea for preventing and treating the common cold. Cochrane Database Syst Rev. 2014;2:CD000530. PMID: 24554461 www.ncbi.nlm.nih.gov/pubmed/24554461. Labella AM, Merel SE. Influenza. Med Clin North Am. 2013;97(4):621-645. PMID: 23809717 www.ncbi.nlm.nih.gov/pubmed/23809717. O’Handley JG, Tobin EJ, Shah AR. Otorhinolaryngology. In Rakel RE, Rakel DP, eds. Textbook of Family Medicine. 9th ed. Philadelphia, PA: Elsevier; 2016:chap 18. Paules C, Subbarao K. Influenza. Lancet. 2017;S0140-6736(17)30129-0. PMID: 28302313 www.ncbi.nlm.nih.gov/pubmed/28302313. Reader Al, Nusstein J, Khan A. Pain control. In: Hargreaves KM, Berman LH, eds. Cohen's Pathways of the Pulp. 11th ed. St Louis, MO: Elsevier; 2016:chap 4. Salwen MJ. Vitamins and Trace Elements. In McPherson RA, Pincus MR, eds. Henry's Clinical Diagnosis and Management by Laboratory Methods. 23rd ed. St Louis, MO: Elsevier; 2017:chap 26. Singh M, Das RR. Zinc for the common cold. Cochrane Database Syst Rev. 2013;6:CD001364. PMID: 23775705 www.ncbi.nlm.nih.gov/pubmed/23775705. Smith SM, Schroeder K, Fahey T. Over-the-counter (OTC) medications for acute cough in children and adults in community settings. Cochrane Database Syst Rev. 2014;11:CD001831. PMID: 25420096 www.ncbi.nlm.nih.gov/pubmed/25420096. Treanor JJ. CLINICAL PRACTICE. Influenza vaccination. N Engl J Med. 2016;375(13):1261-1268. PMID: 27682035 www.ncbi.nlm.nih.gov/pubmed/27682035. Treanor JJ. Influenza (including avian influenza and swine influenza). In: Bennett JE, Dolin R, Blaser MJ, eds. Mandell, Douglas, and Bennett's Principles and Practice of Infectious Diseases, Updated Edition. 8th ed. Elsevier Saunders; 2015:chap 167. Turner RB. The common cold. In: Bennett JE, Dolin R, Blaser MJ, eds. Mandell, Douglas, and Bennett's Principles and Practice of Infectious Diseases, Updated Edition. 8th ed. Elsevier Saunders; 2015:chap 58. Willison HJ, Jacobs BC, van Doorn PA. Guillain-Barré syndrome. Lancet. 2016;388(10045):717-727. PMID: 26948435 www.ncbi.nlm.nih.gov/pubmed/26948435. Willmott M, Nicholson A, Busse H, MacArthur GJ, Brookes S, Campbell R. Effectiveness of hand hygiene interventions in reducing illness absence among children in educational settings: a systematic review and meta-analysis. Arch Dis Child. 2016;101(1):42-50. PMID: 26471110 www.ncbi.nlm.nih.gov/pubmed/26471110. Reviewed By: Linda J. Vorvick, MD, Clinical Associate Professor, Department of Family Medicine, UW Medicine, School of Medicine, University of Washington, Seattle, WA. Also reviewed by David Zieve, MD, MHA, Medical Director, Brenda Conaway, Editorial Director, and the A.D.A.M. Editorial team. Editorial update 10-10-18.